Pete Ward played from 1962 to 1970. Primarily a 3rd baseman, he also played some outfield and 1st base. Until tonight, I thought he had only played for the White Sox, but he was with the Orioles for his first season, and the Yankees for his last. Ward was signed by the Orioles in 1958 and played five seasons in the minors before making his big-league debut in September 1962 with 8 games for the Orioles. Prior to the 1963 season he was traded to the White Sox with pitcher Hoyt Wilhelm, shortstop Ron Hansen, and outfielder Dave Nicholson for shortstop Luis Aparicio and outfielder Al Smith. 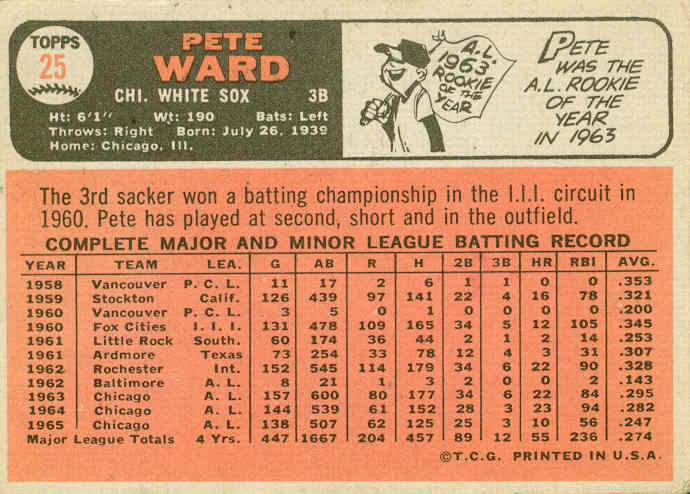 Pete won the 3rd base job as a rookie, starting the first 154 games at the hot corner (with September rookie all-up Don Buford starting the final 8 games). Ward finished with 22 HR, 84 RBI and a .295 average, and finished 2nd in the AL Rookie of the Year voting, behind teammate Gary Peters. In 1964, he nearly duplicated his rookie batting feats (23/94/.282), but his power and average faded in 1965 and he never reached his 63-64 numbers again. Ward was the regular 3rd baseman again in ’64 and ’65, but only played 84 games (including 57 starts in the outfield) in 1966. He returned to full-time status in 1967, but was the team’s primary left fielder. He started 71 games in left and 35 games at 1st base, but only 13 starts at 3B. In 1968 Pete returned to 3rd base, making 73 starts at there until Bill Melton took over the position in September. Like the year before, Ward was also Tom McCraw’s backup at 1st base. 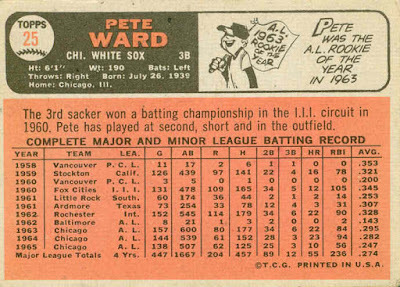 After batting only .216 in 1968, Ward lost a starting position in 1969, getting only 199 at-bats in 105 games, his lowest totals since his 1962 cup of coffee. 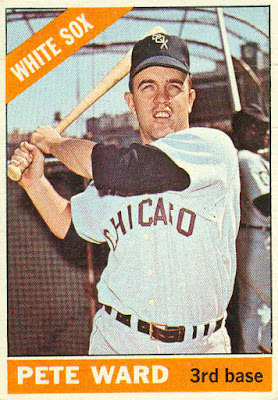 Pete was traded to the Yankees for pitcher Mickey Scott after the 1969 season, and was used mostly as a pinch-hitter in 1970. He was released during Spring Training in 1971. He managed in the Yankees’ system from 1972-77, and for other teams in ’80 and ’81.